So, I have relatives who live on Martha's Vineyard. They live their year-round, so I guess that makes them "townies", or "Islanders". And in spite of me asking them "have you hung out with Carly Simon and/or James Taylor lately?" 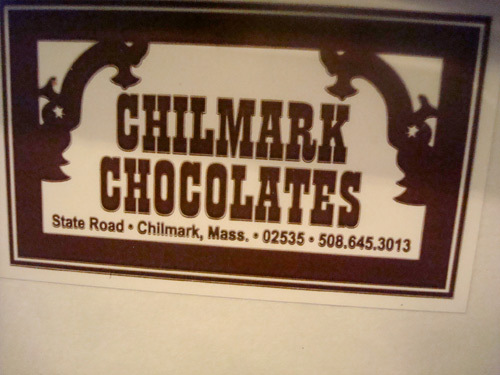 every time we talk, they still love me enough to have introduced me to a sweet island treasure: Chilmark Chocolates. It's true. While recently visiting SpyFamily in New Jersey, the Vineyard division of the family brought with them a box of assorted truffles by Chilmark. At first sight, it appeared to be a fairly regular box of chocolates. But like some guy once said about a box of chocolates "you never know what you're gonna get". And in this case, it was a sweet surprise: old-fashioned, but exquisitely executed chocolate truffles and confections, including milk chocolates, dark chocolates, enrobed truffles, and flat bark-type chocolates. The chocolate was not especially fancy, but more like an exquisite version of an everyday brand, and in that way it became a sort of sublime experience. There is just something about these chocolates. CHILMARK CHOCOLATES began four years ago (CS Note: that would be 1983), the product of a young woman's passion for making fine chocolates. It has evolved into a social experiment in which about 30 workers with disabilities make and sell chocolates, using equipment adapted to their needs. 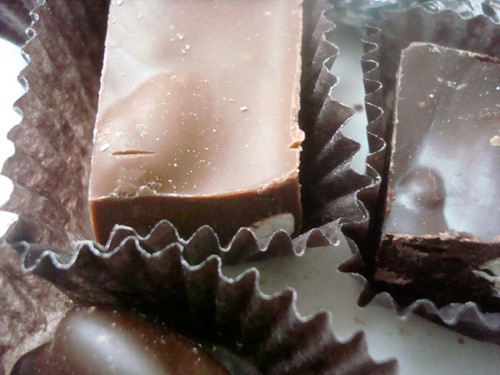 The chocolates, which are hand-dipped or handmade, are Ms. Campbell's invention. She learned the basics five years ago from her father, Malcolm, the vice president of the Van Leer Chocolate Corporation in Jersey City. Soon, she had turned her hobby into a business, making chocolates in her parents' kitchen and selling them in the farmers' market on Martha's Vineyard. All I can say is, next time I visit the Vineyard Division of SpyFam, I'm going to forgo spying on Carly Simon's house and head straight for the sweet stuff at Chilmark Chocolates.